Display Type : LCD with backlight, Bargraph representation. 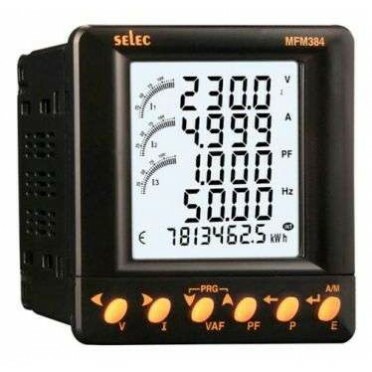 Features & Specifications :Supply Voltage : 85-270VAC, Pulse Output, RS485Display Type : LCD wit.. Features : Password protectionCommunication : Port: RS 485, Protocol: MODBUS RTUCT Primary : 1A/5A t..
Type- 3Phase, 4Wire Counter Type, Class - 1.0Current Range- 1-2A,5-10A,5-20A,10-40A,10-60A,50-100AMo.. This meter uses DSP technology to measure both instantaneous and c.. Features :5 Digit LCD Display, Battery operated, 5 Digit LCD DisplayStart signal- continuous, 12V AC.. Features :Din sized enclosure, Auto / manual Switch, LED indication for relay statusFront button and..